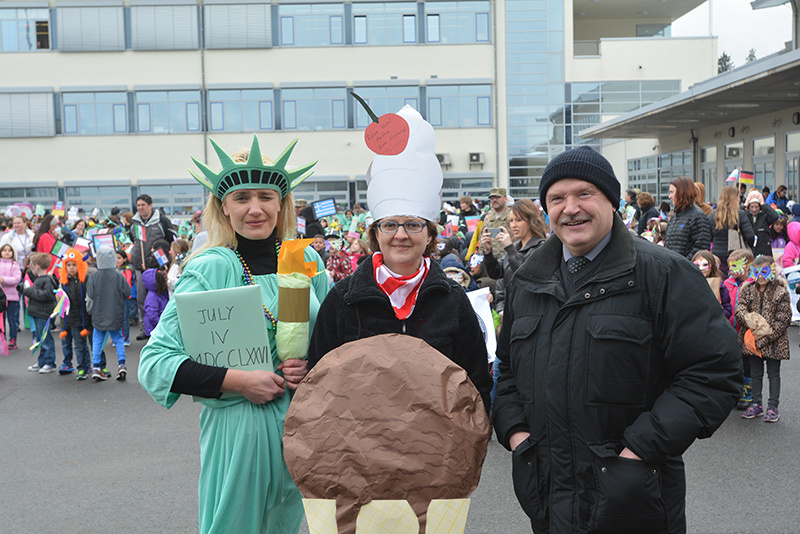 From left, host nation teachers Manuela Bergosh and Sonja Foxworthy welcome Eschenbach mayor Peter Lehr to the Fasching parade at Netzaberg Elementary School Friday. GRAFENWOEHR, Germany — Netzaberg Elementry School celebrated Fasching Friday with a parade that highlighted countries around the globe. Peter Lehr, the mayor of Eschenbach, Netzaberg’s partner town, joined the multicultural celebration of fun and friendship. All 780 NES students participated in the parade, each class sporting costumes and banners from different countries. Host nation teachers Manuela Bergosh and Sonja Foxworthy had helped prepare students by teaching them about Germany’s Fasching customs in the week leading up to the parade. Typical Fasching customs include shouting “Helau”–which students did throughout the parade–and marking the day of Weiberfasching, or women’s Fasching, by cutting off men’s ties. Following the parade, Mayor Lehr praised the spirited event. “This is like German Fasching, but due to the parade’s melting pot theme, it’s a more imaginative carnival,” Lehr said. A native of Eschenbach, Lehr has seen how German and American cultures have influenced each other over the years. “Germans have adopted a lot of U.S. traditions, like Halloween or the cult of barbecue. I can’t imagine grilling without my American Weber grill,” Lehr said. Lehr noted that the partnership between Netzaberg and Eschenbach, both between the towns and the schools, lead to an appreciation of each others’ cultures. “Partnerships, and especially friendships, are the best way to get closer together and to understand each other,” Lehr said.